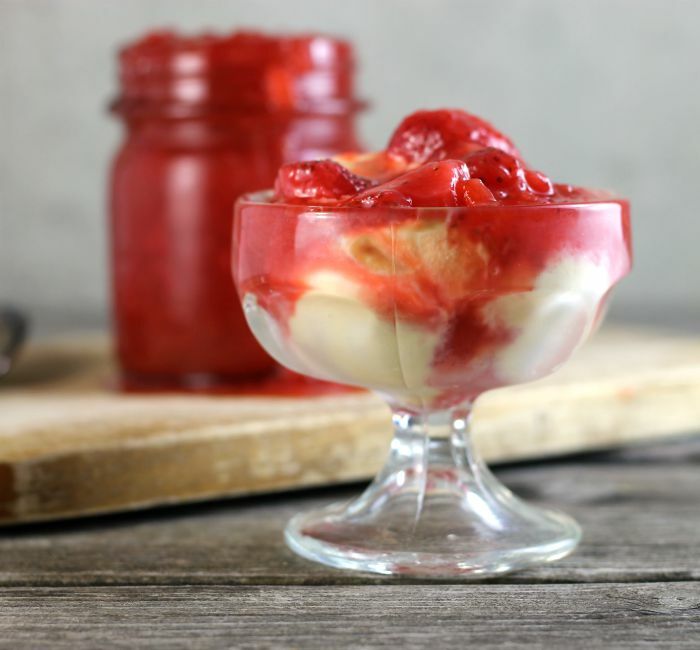 Strawberry rhubarb sauce is a sweet and tart sauce that makes the perfect topping for ice cream, pancakes, angel food cake, and the list can go on and on. 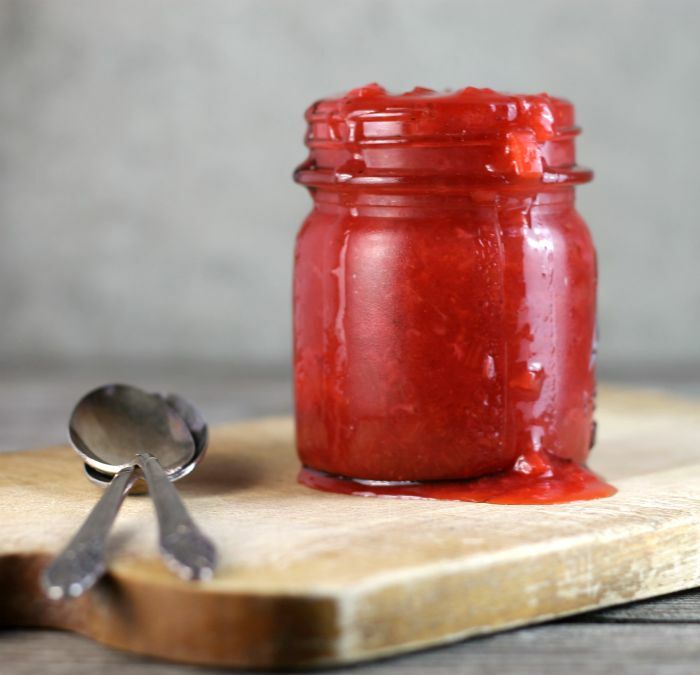 Strawberry rhubarb sauce is super simple to make and is quite versatile. We have already enjoyed it on ice cream and angel food cake, but the possibilities are endless. Mike has suggested that a lemon pound cake would be a perfect pair and I have been thinking about trying it on pancakes. We have this beautiful rhubarb plant that is right next to our garden. Every spring I wait for it to sprout. Once you see the little shoots coming out of the ground you know that the rhubarb will be ready to pick in no time at all. Usually, I make a rhubarb cake as soon as it is ready to pick. It is Mike’s favorite dessert in the spring. And now that I have made the bars a couple of times it is time to move on to other recipes. 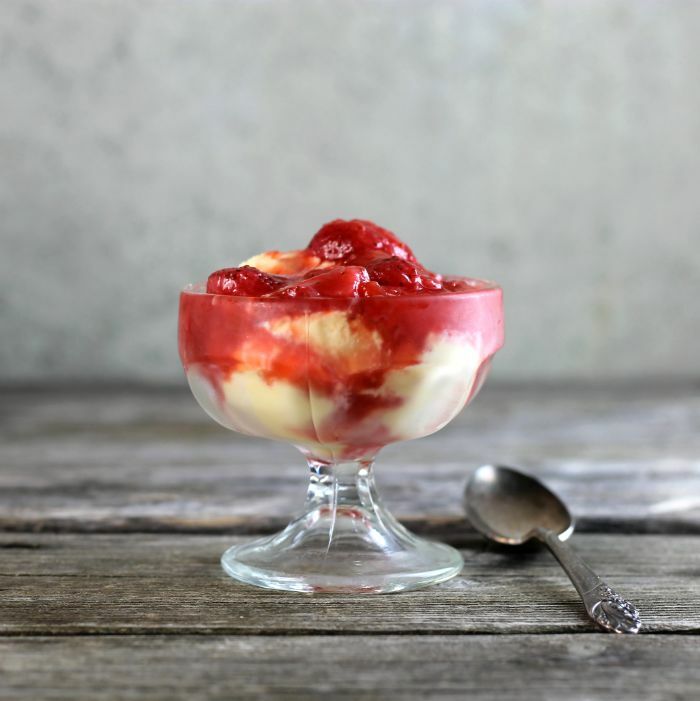 I love the combination of the strawberries and rhubarb. The sweet and tart fruits make a wonderful tasting sauce. 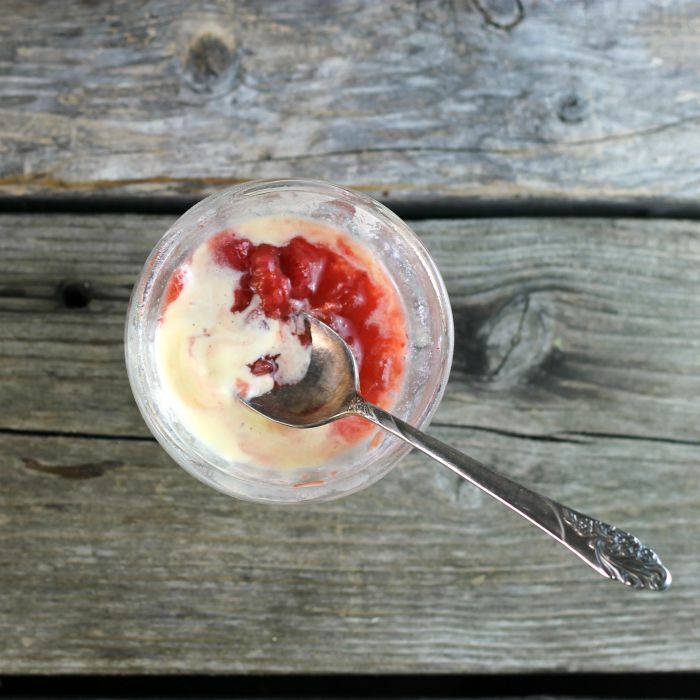 I can’t think of a better way to combine these two summer fruits than this strawberry rhubarb sauce. And let me tell you it is super simple to make. Just add the quartered berries and sliced rhubarb to a saucepan with some sugar, lemon zest, and a little bit of water. Bring the ingredients to a boil and then lower the heat and cook until the fruit begins to thicken slightly. I like to cook the sauce for about 15 to 20 minutes until the fruit is soft. It is still a bit runny at this time, but as it cools the sauce will thicken. So I like to make it in advance and chill it in the refrigerator, the sauce is the right consistency once it chills for a couple of hours or until cold. Add all of the ingredients into a medium size saucepan. Over medium heat bring the mixture to a boil. Reduce heat a little and continue to cool for 15 to 20 minutes, until the fruit is soft and the sauce has started to thicken. Remove from the heat and cool. Refrigerate before serving. Don't worry if the sauce is a bit runny after it is refrigerated and is cooled completely the sauce will thicken. Serve over ice cream, pancakes, cake, or whatever you prefer. A classic combo and the ice cream must be really tasty with this homemade sauce. Oh does this sauce look delicious, I could eat it by the spoonful. How wonderful to be able to grow your own rhubarb. Love the sweet tart and now to find some rhubarb!